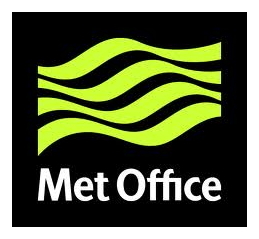 Other members of the proposing team: Chris Harris, Andy Saulter, Juan Castillo Sanchez, Tamzin Palmer (Met Office). Demonstrate the value of providing CMEMS products from ocean-wave systems that are fully coupled with the atmosphere relative to those run with no feedbacks. To deliver the project, a set of coupled and uncoupled ocean, wave and atmosphere model configurations were established, and used to conduct experiments ranging from a few days to a number of years in duration. Figure A shows the modelling systems and research domain used in this work. 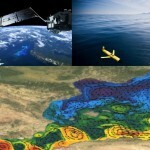 The focus is on a state-of-the-art fully coupled ocean-wave-atmosphere system running at high resolution, encompassing around 174 million grid points in total across components, to represent the various interations and feedbacks which exist between the ocean, wave, atmopshere and land environments. Figure B. 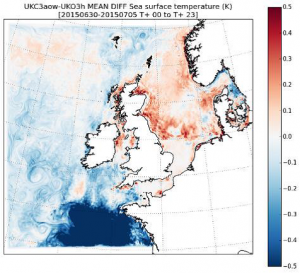 Example change in simulated sea surface temperature (in degrees K) due to surface wave processes over a few days in summer. 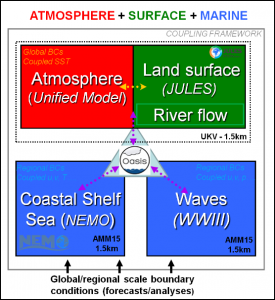 Working with others, the OWAIRS project has delivered new technical capability in the form of improvements to the NEMO community ocean model, which are now available for inclusion and application across CMEMS ocean systems. Several new research insights have been delivered through analysis of the OWAIRS experiments, which are summarised in a series of ten Key Results for use by CMEMS developers when considering future evolution of their systems. For example, Figure B shows the change in sea surface temperature for a simulation of a summer time case study due to use of surface wave information. 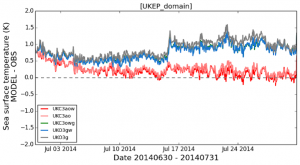 Figure C. Example change in simulated sea surface temperature (in degrees K) due to wave and atmosphere feedback processes at km-scale resolution over a few days in summer. In general sea surface temperatures are reduced because waves reduce the stress acting from the atmosphere on the sea surface and impact on the amount of mixing near the ocean surface. 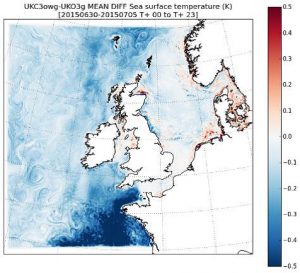 By contrast, Figure C shows the change in sea surface temperature when taking into account both surface wave processes and interactions with the atmosphere. This shows the potential importance of considering both wave and atmosphere feedbacks in providing useful ocean predictions. The OWAIRS research shows that accounting for these modelling sensitivities can lead to improved agreement between ocean model results and observations of surface temperatures from ocean buoys, as shown in Figure D.
Figure D. Average difference (in deg. K) between simulated and observed sea surface temperature over a month-long period for an ocean model with no feedbacks (grey line), with surface wave feedbacks included (blue line), with only atmosphere feedbacks included (light red line) and with both wave and atmosphere feedbacks included (dark red line). Analysis of a number of relevant ocean variables has taken place in OWAIRS, with results showing that inclusion of wave and atmosphere feedbacks and the modification of ocean dynamics in high resolution systems can lead to relative decrease of surface current speeds, higher coastal water level, and increased sea surface salinity. 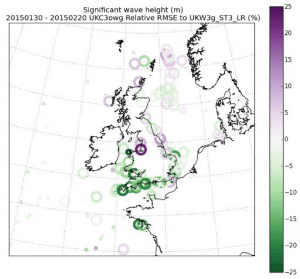 Figure E: Difference in level of agreement between model and observed wave height, with stations in green showing improvements with use of ocean feedbacks. The OWAIRS research also considered the effect of using information on the ocean state in surface wave simulations. 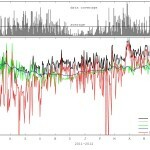 Results are found to be highly sensitive to the quality of wind information, but as shown in Figure E, improvements to predictions when compared with observations can be made. The OWAIRS project has delivered new tools and scientific understanding that can now be used by CMEMS developers and applied in the coming years in order to deliver improved products to users.